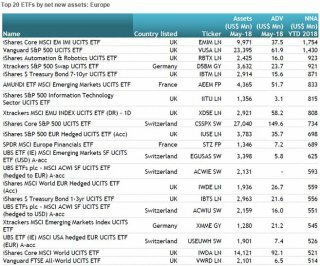 ETFGI, a leading independent research and consultancy firm on trends in the global ETF/ETP ecosystem, reported net inflows of US$2.89 billion into ETFs and ETPs listed in Europe during May 2018, marking the 44th consecutive month of net inflows into European-listed ETFs/ETPs. 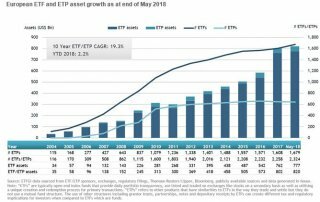 Equity ETFs/ETPs gathered the largest net inflows of $2.07 Bn during May, bringing net new assets for 2018 to $23.7 Bn, which is lower than the $32.6 Bn in net inflows at this point last year. Fixed income products experienced their largest net outflows of the year with $714 Mn during May, bringing net inflows for 2018 to $4.20 Bn, which is also less than the $12.4 Bn in net inflows at this point last year. The majority of net inflows can be attributed to the top 20 ETFs by net new assets, which collectively gathered $15.5 Bn during 2018. 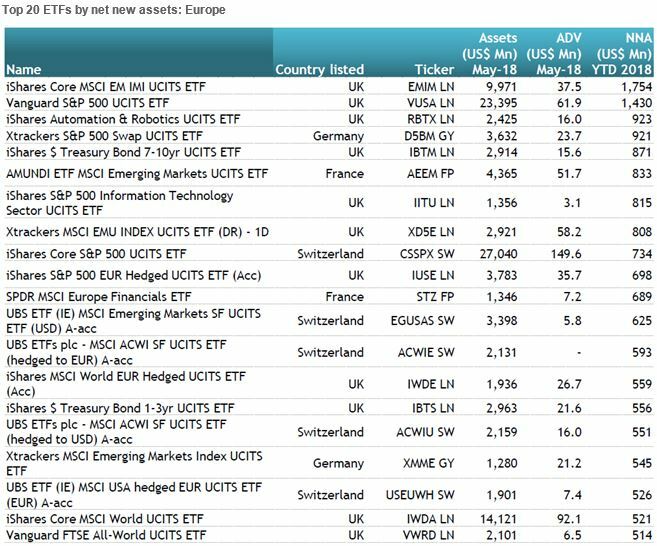 The iShares Core MSCI EM IMI UCITS ETF (EMIM LN) on its own accounted for net inflows of $1.75 Bn. Notably, the top three ETFs/ETPs by net inflows year-to-date end had equity exposure outside Europe.